Add 1 LIGHT Machine monster that cannot be Normal Summoned/Set, or 1 "Cyber Dragon" monster, from your Deck to your hand. If the activation of this card in its owner's possession was negated by your opponent's card effect and sent to your GY: You can discard 1 card; add this card to your hand. 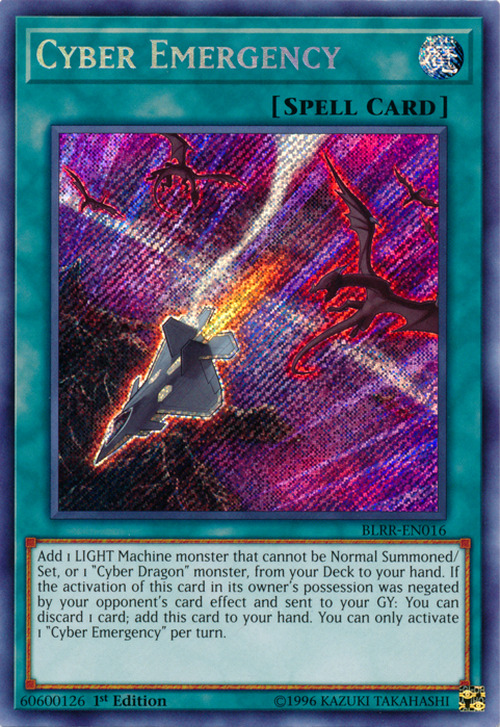 You can only activate 1 "Cyber Emergency" per turn. The jet featured in this card is an F-22 Raptor.